In 2011 when I began my PhD studies at Australia’s Monash University, Dr Andy Butfoy and I had a conversation about John Nash Jr, Thomas Schelling, the RAND think tank, and game theory. I had also recently re-watched the Adam Curtis documentary The Trap (2007) on how Nash’s insights influenced corporate negotiators and labour unions. My first task for Andy was to reconstruct the history and prehistory of strategic culture theory-building, I soon found the parallel work of Jack Snyder, Colin S. Gray, and Ken Booth for RAND, the Hudson Institute, and US war colleges. It became clear that Nash and Schelling’s game theory was a rival research program to strategic culture and also to rational choice theory which Snyder adopted in later research. Now, MIT’s S.M. 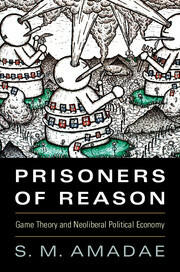 Amadae has given us Prisoners of Reason: Game Theory and the Neoliberal Economy (Cambridge: Cambridge University Press, 2016) – a well documented history of how game theory’s emphasis on strategic rationality influenced research and policymaking in nuclear strategy, economics, sociobiology, and the environment. Amadae contends – as Curtis also did in The Trap – that noncooperative game theory and coercive bargaining gave economic and political elites the leverage to dominate others. The result is a highly competitive society in which brinkmanship and rentier extraction outflanks more cooperative solutions: winner-takes-all. I’ll likely cite Amadae in Chapter 1 of my thesis.